Shop at home! Give little imaginations the perfect place to bloom – and set up shop! – with this adorable market playhouse. Standing just over four feet tall, the exterior is adorned with blooming flowers printed on the double-sided fabric walls. Inside depicts a sideboard crawling with pantry staples, jars of yummy treats on the windowsill and a real fabric curtain above the window. 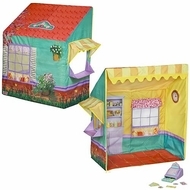 Little ''shoppers'' can order from the walk-up window, while the ''store clerk'' works inside, pretending to pack and sell the freshest fruits and vegetables, or make imaginative ice cream creations for friends! Transactions are made on the play cash register that comes with play money, while "clock" on the wall lets everyone know how long until closing time. Moms and Dads will find the lightweight structure simple to move and nest Dream Town accessories (sold separately) for fast, easy storage. Who would've thought that the best place for your little girl to play ''store'' is located in the nicest neighborhood she knows - your very own home!